With 28 offices in 18 countries, Ausenco are a global, diversified engineering and program management company that provides services across the energy and ressources sectors. 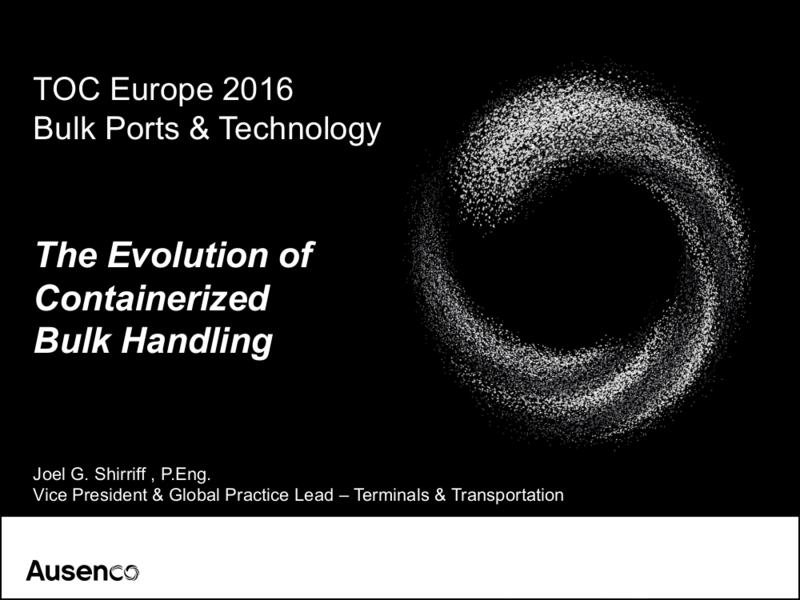 Recognising the emergence of containerized bulk handling, Ausenco acknowledged in their Bulk Ports and Technology session at TOC Europe 2016 the efficiency and cost effectiveness of using the Containerised Bulk Handling system for handling bulk commodities. The session explained the simple 4 step process of load & seal, transport, store, unload into ship. Ausenco also mentioned the flexibility of using the system at standard container ports or terminals where existing port equipment can be used during the process to also export bulk due to the containerisation of the bulk material, with added benefits of no stockpiles and no contamination. Ports and Terminals can load standard containers on Monday, bulk on a Tuesday, containers on Wednesday. Summarising; bulk materials are loaded in the conventional way at the mine or facility by side loader, the container is then sealed, transported by road or rail to the port and stored eliminating stockpiles and contamination of commodity. The RAM Revolver, attached to the port crane lifts the container then brings it to the ships hold, lifts the lid and then tips the commodity gently into the ships hold.